I’m so glad to be back visiting Susana and all of you! I’m here today to tell you about When a Marquis Chooses a Bride, Book #2 in The Worthingtons. For those of you who read Three Weeks to Wed, the first book in the series, you might recall Charlotte bemoaning that her dearest friend, Dotty Stern could not come out with her. In typical Worthington fashion they figured out a way to give Dotty her Season, and that’s when the fun begins. Note: Ella is giving a signed copy of When a Marquis Chooses a Bride to one random commenter. Early afternoon sun poured through the windows of the large airy schoolroom in Stern Manor. The space was filled with bookcases, four desks, two sofas, and sundry toys. Miss Dorothea Stern sat on the larger of the much-used sofas, threading a strand of rose silk through her embroidery needle. She had one more Damask rose to complete before the slippers she was making for her mother were completed. But no matter how hard she tried, she could not escape the fact that the neighborhood was sadly flat now that her best friend, Lady Charlotte Carpenter, was gone. For years, they had planned to come out together, just as they had done everything else since they were in leading strings. In the meantime, there was a great deal to keep Dotty busy. Since her mother’s accident, she had taken up Mama’s duties. Dotty enjoyed visiting their tenants, talking to the children and their mothers, and finding ways to help them. Their father, Sir Henry, was a classical scholar and had been a rector before his older brother’s death a few years ago. Much to Henny’s dismay, he had decided to teach all the children Latin and Greek. “If that’s the case, you may become a spinster,” Henny shot back. Charlotte’s older sister, Grace, was now the Countess of Worthington. She had taken all five of the younger children with her to London for Charlotte’s come out. 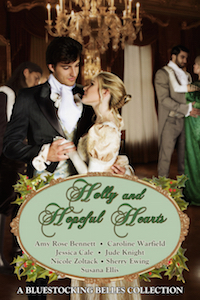 Shortly after arriving in Town, Grace had met and fallen in love with Mattheus, Earl of Worthington. They had wed three weeks later. Not long ago, Grace and her new husband had returned to Stanwood Hall for a few days so that Lord Worthington, who was now guardian to her brothers and sisters, as well as his own sisters, could inspect the property. Dotty hurried to the door. “I hope everything is all right.” There was nothing wonderful in receiving a letter from London. Practically everyone they knew was in Town for the Season. Mama and Dotty should have been there as well, yet the day before their planned departure her mother slipped and broke her leg. Bestselling author Ella Quinn’s studies and other jobs have always been on the serious side. 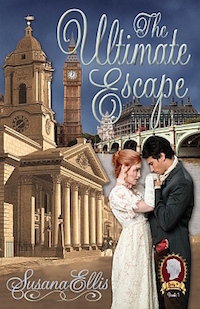 Reading historical romances, especially Regencies, were her escape. 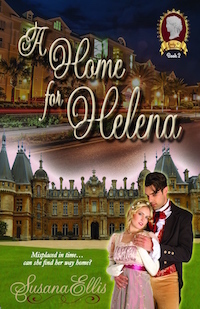 Eventually her love of historical novels led her to start writing them. She has just finished her first series, The Marriage Game, and her new series, The Worthingtons began in April 2016. She is married to her wonderful husband of over thirty years. They have a son, two granddaughters, and a dog. After living in the South Pacific, Central America, North Africa, England and Europe, she and her husband decided to make their dreams come true and are now living on a sailboat cruising the Caribbean and North America. Sitting at his writing table, Kit removed his gloves. Well, at least this got him out of Town and bride hunting. Guilt attempted to take hold, and he shook it off. Who the devil would have the unmitigated presumptuousness to pose as his wife? Despite supposedly being a lady, though one would have to be awfully talented to fool Lady Bellamny, the woman would have to be a bold piece. The sooner he got on his way, the faster he’d have the answers to his questions. Perhaps he’d run down Lady B and try to pry more information out of her. On second thought, that would involve her more than he wished. She was trying enough. He certainly did not want her meddling in his affairs, and he’d run the risk of meeting the young lady residing with her. He wanted to punch something or someone. It was a shame he did not have the time to go to Jackson’s. He could not believe a lady was masquerading as his wife—only an experienced charlatan would be able to pull off a deception like that. Not to mention that no lady would demean herself so, and take such a risk with her reputation. Whoever she was, she wouldn’t be there for much longer. 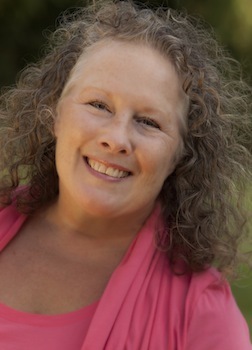 Ella is a member of the Romance Writers of America, The Beau Monde and Hearts Through History. She is represented by Elizabeth Pomada of Larsen-Pomada Literary Agency, and published by Kensington. Robert, Viscount Beaumont, remembers all too well what it feels like to be in love. That is why he must keep his distance from Serena. He’s only felt his pulse stir the way it does now when he made the mistake of loving the wrong woman once before. Yet the more he strives to resist his feelings, the nearer he is to falling under Serena’s seductive spell. . . Haunted by her past, Lady Caroline Martindale fled England for the solace of her godmother’s palazzo in Venice. But if Caro was hoping to escape the charms of marriage-minded men, she’s come to the wrong place. And she’ll resort to extreme measures to spurn the advances of a dangerously determined Venetian marquis. 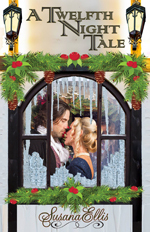 . .
Three more novels will be along later, and then the series will end with a novella, Madeleine’s Christmas Wish. 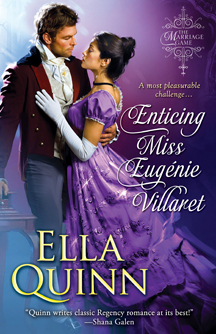 Bestselling Regency author Ella Quinn lived all over the United States, the Pacific, Canada, England and Europe before finally discovering the Caribbean. She lives in St. Thomas, Virgin Islands with her wonderful husband, three bossy cats and a lovable great Dane. Ella loves when friends connect with her. 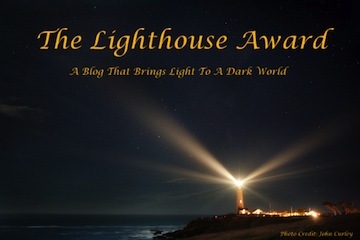 Susana’s Parlour Got Nominated For a Lighthouse Award…by some Scottish hamsters! Shehanne Moore is a hoot. A Scots hoot to boot. (Oh look, I’m a poet!) Her Lady Fury hosted me on Furious Unravelings, and I’ve never had so much fun in my life hobnobbing with pirates in the Caribbean. This writer gig is really the best. I never got to meet pirates when I was a teacher! 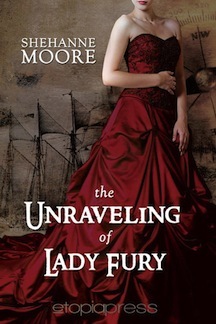 To find out more about Lady Fury and her own special pirate, Flint, check out The Unraveling of Lady Fury. Anyway, Shehanne’s pet hamsters have nominated me for a Lighthouse Award. Isn’t that fabulous! They’re so cute too! Check ’em out here. Write a post and link back to the blogger that nominated you. Inform your nominees of their award nominations. Share three ways that you like to help others. Nominate as many bloggers as you like. I love to host other authors on my blogs. 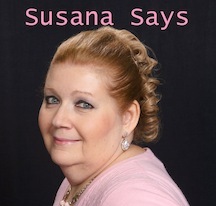 Susana’s Parlour is for historical romance (mostly Regency) and Susana’s Morning Room is for all sub-genres of romance. I’ve met so many fascinating people, and I hope featuring them and their books helps them find new readers. Information about guest blogging is available in the top menu under Susana Seeks Guest Authors. I also host for Goddess Fish Promotions. Another thing I enjoy doing is organizing blog tours and hops. After participating in a few very large hops featuring a diverse group of authors, it occurred to me that smaller hops focusing on a single sub-genre—historical—might be more effective.While you still get some folks who are mostly interested in the prize, there seem to be more who are truly interested in discovering new books to read.It’s fun to experiment with new things and discover more about what works and what doesn’t. And I LOVE putting together treasure boxes full of cool stuff for the winner! 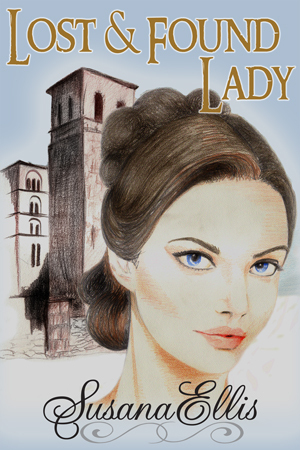 Most of all, I enjoy posting about historical information for the benefit of my readers.That’s why I created Lady P, an eccentric Regency, time-traveling lady who comes to Toledo (and now Florida) to help Susana learn about the “real” Regency. 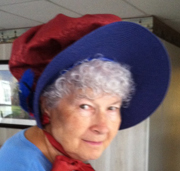 Lady P bears a strong resemblance to my mother, Mrs. Ellis, and I am featuring her in my current WIP, a time travel. Much of what I learn in my own research gets shared here on Susana’s Parlour. Congrats to all the nominees! You deserve it! The Seduction of Lady Phoebe is the first of a series called The Marriage Game. 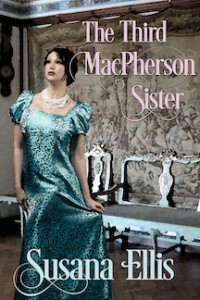 The second in the series, The Secret Life of Miss Anna Marsh, was featured earlier on this blog. SUSANA SAYS: Two delightful characters who truly deserve their happy ending! 5/5 stars! Marcus Finley “knows” Phoebe Stanhope is for him the first time he sees her. Unfortunately, his cockiness and inebriated state cause him to take far too many liberties with the innocent fifteen-year-old, and she runs away, traumatized. Marcus realizes he has burned his boats with her, and agrees to be sent to the Caribbean to manage the family holdings. But he doesn’t forget Phoebe; he names his ship after her and hopes against hope that when he returns she’ll still be available and willing to forgive him. 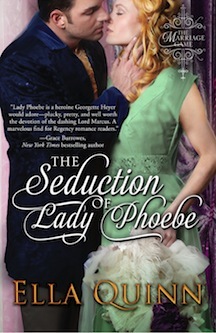 Unfortunately, the name Marcus Finley only holds contempt for Phoebe. She turns down suitors and hopes to be able to set up her own establishment, fearing to put herself into the power of a man like Marcus. But when they finally meet again, she doesn’t recognize him, and, in fact, finds herself drawn to him, and eventually allows him to “court her”, as long as she can be in charge of the courtship. Her brothers-in-law, who approve of Marcus, agree to help speed up the process, and before too long the pair is deeply in love. But Marcus has a deadly enemy determined to get revenge on past events who decides that Phoebe would be an excellent target. Both Marcus and Phoebe have to fight to eliminate this threat before they can settle down to their life together. I happen to love feisty heroines who know what they want and don’t bow down to outside pressure…and if they can fight with swords and pistols and knives, so much the better! I also love heroes who love deeply and truly and don’t give up hope even when their chances of success seem hopeless. Ella Quinn is a bright new star in the Regency genre, and this, her debut novel, won’t disappoint. Ella Quinn lived all over the United States, the Pacific, Canada, England and Europe before finally discovering the Caribbean. She lives in St. Thomas, Virgin Islands with her wonderful husband, three bossy cats and a loveable great dane.